When I was young, my parents shopped for food stuff and other household consumables at Mama Peter’s wholesale and retail shop. My siblings and I went to the same shop even when we were not accompanied by our parents. It was where we waited for my mum when she went to the market, and when we went to town, we passed by just to say hello. Then supermarkets came to our town. Supermarkets found their way into urban towns and slowly started replacing the traditional retail shops. Festive seasons are a good reality of this as everyone goes home with bags and boots full of supermarket purchases. This switch however, as Kathrin Demmler and her team of researchers found, has resulted in an increase in overweight and obesity, and contributed to the rising cases of nutrition related non-communicable diseases, such as prediabetes and metabolic syndrome in urban Kenya. How many times have you bought chevdas just because you see them? These supermarket effects have been associated to factors such as variety, marketing strategies, packaging sizes as well as the shopping environment, which influences consumer’s choices and diet. For instance, you will always find there is a smaller packet of chips or biscuits that goes for less. 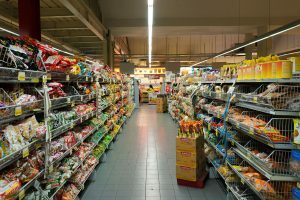 According to the study, those who shop at the supermarket consume more calories from processed snacks and refined grains, fats and oils, soft drinks, meat, fish and dairy products than those that shop in the traditional retail shops. This is in addition to consuming less of vegetables and unprocessed grains. Now I am not saying no to shopping at the supermarket. Just don’t go shopping when hungry. Read the nutrition information and go for less oil, fats and sugar. Also, pick what is not or is less processed, has been fortified, and not don’t pass the fruits and vegetables section. Could soft drinks increase the risk of cancer no matter your weight? Wait. Did you read the health warning on the cigarette pack?